On a spring day in 1836, Texian soldiers clambered over a rushing stream in southeast Texas followed by a ruthless and determined Mexican dictator named Santa Anna. General Sam Houston said, “this is far enough.” On April 21, 1936, Texas became Texas on the mosquito plagued swampy marshlands along the banks of Buffalo Bayou. Texas spread out from its birthplace at San Jacinto but a few saw the benefits of the Bayou’s access to the sea and hung around. They founded “Houston City,” destined to grow and dominate the land like few other cities in Texas. In the early days, commerce thrived along the Bayou. It provided access to the Gulf of Mexico and water for factories, business and homes in the fast growing town. When Texas was still a Republic the first steamship paddled its way up to Allen’s Landing. Eventually the lower end of the Bayou would be dredged to create the Houston Ship Channel, one of the busiest waterways in the world lined with the docks and warehouses of the Port of Houston. 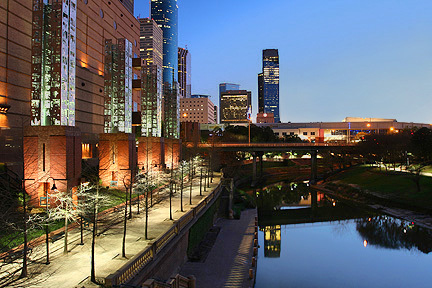 Houston was destined to become something far greater than a little town on a waterway. It was perhaps inevitable that the Bayou would fall into the shadow of the now massive city which was born along its banks. These days Its water flows beneath more than fifty bridges as it meanders from west to east through the city. Progress has moved elsewhere…but this isn’t the end of the story! This is only the beginning. Buffalo Bayou is, in fact, as vital as ever. Crowded by towering buildings and hemmed in by concrete, Houston’s citizens have increasingly turned to the Bayou for escape. In fact, as far back as 1902 there were some Houstonites who recognized the value of recreation along the Bayou. They created Sam Houston Park at the site of a former brick yard. Houston’s first zoo was opened there. But after some years the zoo was moved and the park fell into decline. Fortunately, citizens began to realize how important the park and the Bayou truly is. They started the Bayou’s transformation from a place to work to a place to play. 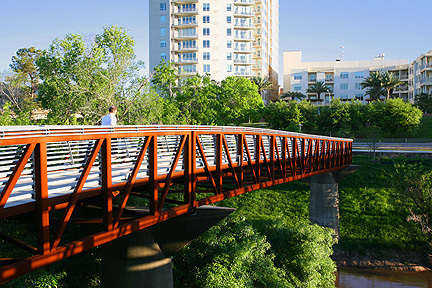 These days Buffalo Bayou, dotted with parks and liked with trails, is one of the most popular outdoor destinations in the Houston area. 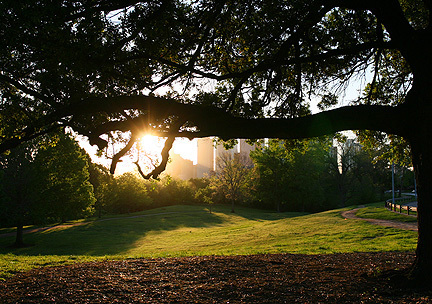 Buffalo Bayou Park is to recreation as Sam Houston Park is to history. It’s one of the largest and most popular, with hiking trails, exercise stations, a dog park, boat launch, skate board park and playground. The Police Memorial is located there. 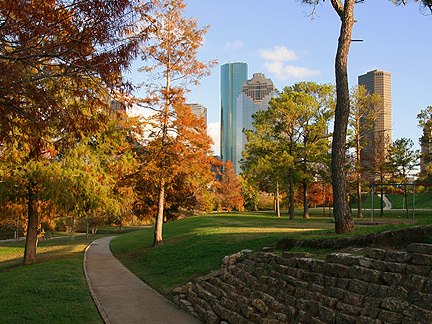 Sesquicentennial Park, near Wortham Center, is one of the most impressive public spots in all of Houston. The “Seven Wonders,” seven 70’ tall pillars that tell the history of Texas, is only one element of this expansive park which has a promenade, a fountain, pavilion, and lots more to give families something to do on lazy summer afternoons. History and recreation come together at Allen’s Landing Park, site of Houston’s original port and docks. The simplest, and best, way to discover the entire Bayou is to take a boat tour. There are monthly tours boarding on the north side of the Bayou at the Sabine Promenade, one going East to the Ship Channel and another West passing through Houston’s urban skyline. No reservations are required for the half-our trip on the 21 passenger pontoon boat, but seats do go quite fast. Public tours are offered every second Saturday of the month unless weather, flooding conditions or events on the Bayou interfere. Private tours are also available. An even better way to traverse the Bayou on the water is by canoe or kayak. The Bayou has been designated an “official paddling trail” by the Texas Parks and Wildlife Department. Kayaks are sometimes available for rent or adventurers can bring their own and launch them at Buffalo Bayou Park or the Sabine Promenade. A large crowd of spectators come to watch dozens of paddlers once a year for the Buffalo Bayou Regatta, Texas’ largest canoe and Kayak race. Buffalo Bayou twists and turns fifty miles from its source to the ship channel, passing through thirty five miles of urban Houston real estate. It provides an exceptional respite for urban dwellers close to home. Hiking and bike trails not only abound within the parks but along the Bayou between the parks as well. The city continues to improve the trail system, developing a full twenty miles of well lighted, paved trails between the various parks along the water. Projects costing in the tens of millions of dollars are in planning or underway by the City of Houston. 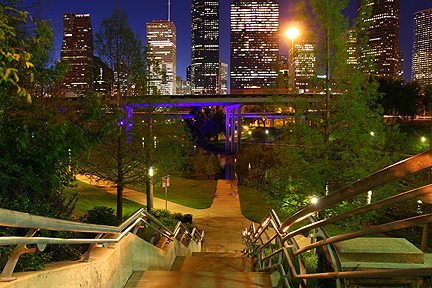 In conjunction with the trail project, the “Buffalo Bayou Lighting and Public Art Master Plan” is guaranteed to bring Houston back to its roots along the Bayou. See Buffalo Bayou Partnership for more information.